Landing pages are super important to any online marketing campaign. Once people click on one of the ad links to your website, the landing page is the first thing that they see. This page should, therefore, be tailored exactly as your target audience would expect you to. But, even as there is no dearth of a decent SEO company in India, most landing pages still seem to be lacking in many respects. It looks like, people are always confused as to where to start, whether to create just any page and hope for the best, or create multiple pages and then choose the best, and so on. The headline and subheadings are one of the primary concerns of SEO services providers. That’s because these are the elements which build the initial trust amongst your audience. A strong heading always proposes a strong value, that further by Ives people a reason to stick around your site and consider your offer. The main thing is, your heading should be consistent with the expectations you’ve created through your advertisements. Keep it clear and concise, to build the confidence of your audience, and maintain their momentum. A landing page is meant to help a potential customer convert to an actual buyer. The transition one makes from being merely interested in your website, to actually act upon it, takes a brilliant call to action. The landing page can only be said to work properly if its call to action encourages people to at least read further content if nothing else. Whether keep it at the top or at the bottom, whether or not it’s a simple button, it has to be clear. That is, a people should know exactly what they’d be in for when they act on the CTA. That way, they’ll feel motivated to do what it is you want them to do. Everyone today doesn’t just own a mobile device, but they are on their devices almost all the time. In a world where you can’t separate people from their cell phones, it’s only obvious that you make your landing page mobile-optimized. While it will be a pain to make the page optimized for both desktop as well as mobile screens, but it’s a pain you’ll have to make your web designing company bear. Content forms an extremely important part of any page and more so, for the landing page. If your potential customer has to read aimed again and again to get the gist of it, then it obviously isn’t good enough. They shouldn’t have to try to figure out what you mean; it should be an easy read, with a clear-cut message for the reader. To make sure your content is free of grammatical errors misspelled words, and redundancies, proofread it properly. Better yet, you could get it proofread by someone else; many a third-party website designing company in India provide such services. The less your potential customers have to think while reading your content, the more likely they’d be to convert. Not just the heading, but it is every element on your page that communicates your brand value to your customers. If you have too many images or too much information for a user to comprehend, it will only end up confusing them. And that’s definitely not good for your business. You want the goal of your landing page to be, making a potential customer become a buying one. If your page elements are not helping you get to that goal, they’re insignificant at best and distracting at worst. Under any condition, any website designing company would advise you to do away with them. Testimonials are a super useful way to get the attention of your target audience. But, only the testimonials that are right, as well as compelling in nature. While it’s true for even a third-party page, it is more so significant when we talk of a landing page. Especially in case of the latter, the advantage is, you can choose which of the testimonials to feature. You want your potential customers to be besotted by your products or services, and it is the user reviews or testimonial section that they look out to give them the right answer. A testimonial is only good if it comes from a verifiable source, and is clear and concise in nature while talking specifically about you and your business. What makes one the best SEO company in India, is being able to choose such testimonials for their clients. 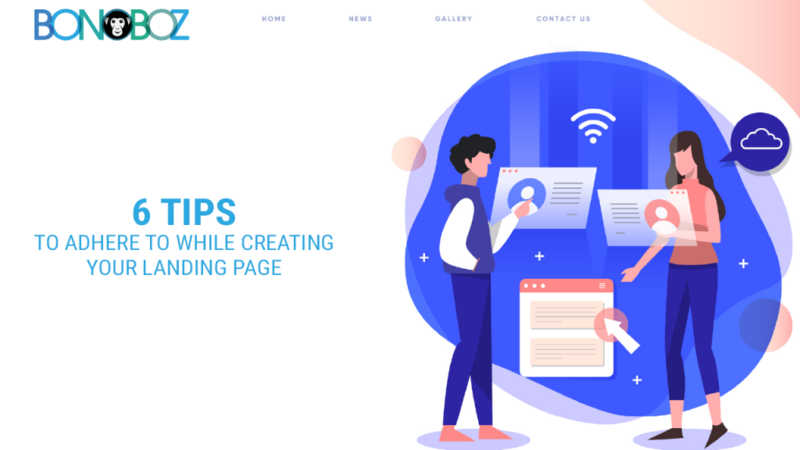 It is after years of building landing pages and testing them over an over that you come across these 6 simple yet brilliant points. Following these tips could make your page into a huge asset for your online marketing campaign and Internet presence.